Partition and adsorption chromatography is the most widely used analytical method in HPLC analysis. Shodex polymer-based columns for partition and adsorption chromatography (reversed and normal phase) is superior to silica-based media in range of eluent selection, lot reproducibility and durability. Especially new products ODP2 HP series has been improved theoretical plate number compared with general polymer based columns, almost twice better. It becomes close level to general silica based columns. ODP2 HP is polymer based new reversed phase column. The theoretical plate number has improved nearly double comparing with current polymer based column ODP-50. 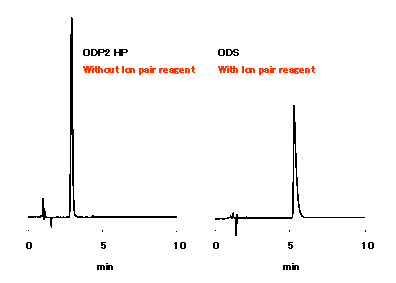 One of short amine, atropine was analyzed using ODP2 HP without addition of ion pair reagent. ODP2 HP is reversed phase column packed polymer beads, and it can be used with alkali eluent. So there is no need to add ion pair reagent. Please refer Analysis of Short Amines without Using Ion Pair Reagent to know detail about merit of using polymer based column. 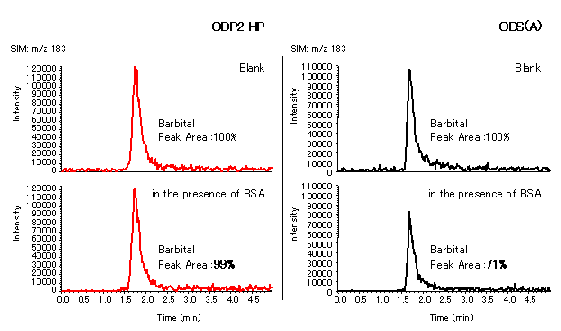 Biological sample was analyzed directly using ODP2 HP . ODP2 HP is polymer based reversed phase column. One of advantage of ODP2 HP is very low adsorption of protein, because the surface of the packing material is high polar and the pore size is small. Since proteins like BSA are eluted early and its peak shape is sharp. 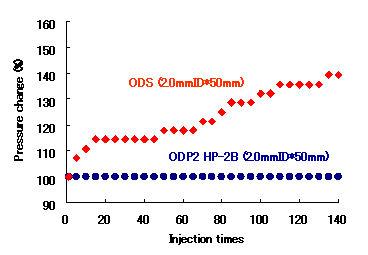 ODP2 HP can separate drugs from proteins. 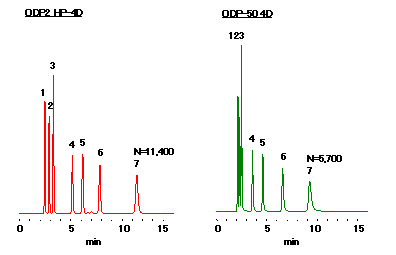 Four LC/MS chromatograms of barbital were shown. These are comparison of using ODP2 HP and ODS, and barbital without BSA and with BSA. In using ODS (right), the peak height of barbital with BSA were lower than without BSA. It means there was ion suppression by existence of BSA. The comparison data of recovery of barbital also showed influence of BSA to ODS. 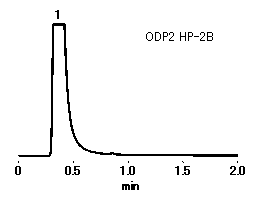 ODP2 HP can be used for analysis of low molecular compounds in biological sample without bad influence of protein.